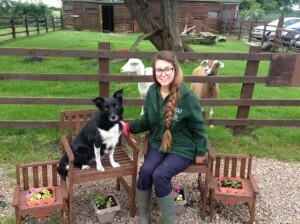 Laura Reeve enrolled onto the Level 2 Diploma in Animal Care programme at The College of Animal Welfare in August 2015. We caught up with Laura and asked her to share some of her experiences about her time on the course. In April 2015 I began volunteering three days a week at HULA Animal Sanctuary in Bedfordshire. I’ve always loved animals and wanted to start a career in the Animal Care sector. I knew job vacancies in this sector are often very competitive, so I started by volunteering with the small animals, the cattery and dog walking at the centre. Along with my volunteering I wanted to gain a qualification relevant to the job so I decided to find a course in Animal Care. In August 2015 I enrolled onto the Level 2 Diploma in Animal Care. This course was perfect for me as the course can be studied as a work-based learning course (no college attendance required) with regular visits from my tutor and assignments to complete in my own time. Throughout the year I gained a lot of new skills and was able to build upon my knowledge. Caring for such a diverse range of animals provides an interesting but rewarding challenge. When I’m working in the small animal house, cattery or kennels I spend most of my time cleaning, feeding, walking and providing basic veterinary care and enrichment. 10 months on and I have completed the course and have also been made a permanent member of the Animal Welfare team at HULA. Everyday is different and throws new challenges, but I love every minute of it. I plan on building a career in Animal Care and taking new courses with the College of Animal Welfare to expand my knowledge.